Yarn and Fiber Happenings: Meet New Plymouth Yarns - New Colors, New Yarns are Available for You for Spring! 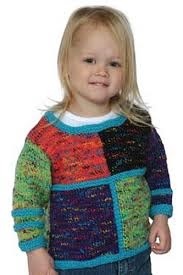 Encore Mega Colorspun with A Free Pattern and New Project Class Wednesdays! 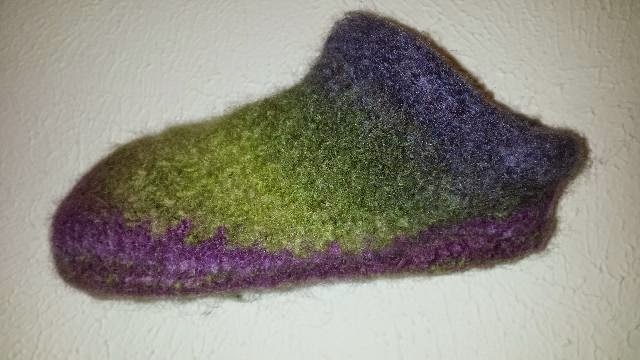 Felted Clogs Are a Blast to Make and Super-Cute! Meet New Plymouth Yarns - New Colors, New Yarns are Available for You for Spring! Encore Mega Colorspun with A Free Pattern and New Project Class Wednesdays! Felted Clogs Are a Blast to Make and Super-Cute! Just in and New this Spring! Plymouth Homestead Tweed and Solid Yarn! Plymouth Homestead Yarn is a 100% wool, heavy worsted weight yarn in a nice range of solid and tweedy colors. Homestead Yarn is a 100% wool while it Tweed companion yarn is made with 90% plain wool and 10% Donegal wool, Homestead Yarn has a rustic look with a soft texture, and it works up beautifully into blankets, warm sweaters, hats, mittens & accessories. Plymouth Homestead Tweed and Solids also felt beautifully for warm slippers and mitts! Colorblock Sweater P519 from Plymouth in Jelli Beenz Yarns! 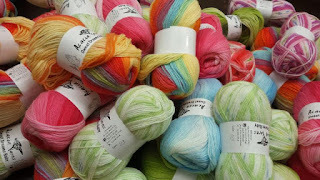 Also, we have received the new colors (as well as a restock of all last years colors) of Jelli Beenz yarn. Jellie Beenz is a smashing yarn that works well for fun garments that zing! Jelli Beenz is a worsted weight yarn that comes in a variety of colors and is practical for everyday use as well as a specialty garment. Check out these beautiful yarns today! And another new yarn - Plymouth Encore Mega Colorspun and Solids is a new super bulky that works up fast on a US #15 needle! Each 64 yard skein of this easy care machine washable yarn is 75% Acrylic and 25% Wool. 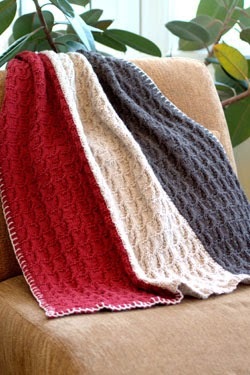 Check out the Free PDF Pattern for the Plymouth Encore Mega Colorspun Seed Stitch Cowl. 2 skeins of Encore Mega and US 15 make this cowl a breeze in a couple of hours. A great gift idea! More and more patterns are added to the website everyday! Lots of Debbie Bliss Books (old and new) are now available as well as Yankee Knitters, Knitwhits, and too many to mention names! Most books, magazines and patterns are on special through June 1, 2015. The selection is immense! Announcing new project classes on Wednesdays! To kick things off, we will be making Felted Clogs. 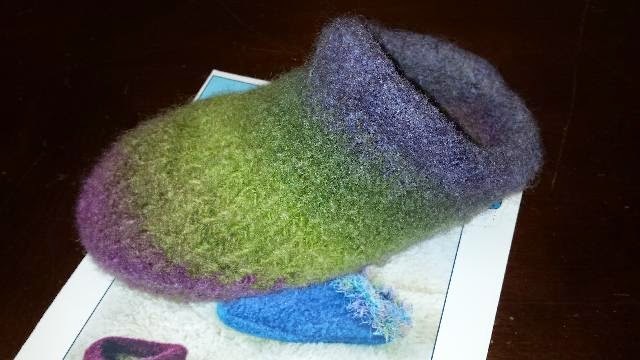 These adorable felted clogs are beautiful when made in solids or using self striping yarns. The pattern we will be using covers Women's and Men's clogs. Class will meet on April 1 and April 15 from 10-12 and there is a $50 class fee. You can come by the store or call and sign up over the telephone (603) 505-4432. We are suggesting using Plymouth Gina, Plymouth Mushishi, Cascade 220, or Plymouth Galway yarn. Pattern, needles and yarns are all available in the shop. Call to reserve your seat and let's have some fun! Have something that you want to make in a class? Let us know; we would love to hear your suggestions for a new project class! More Classes, More Buttons, More Yarns, More Fibers and More Patterns arriving Weekly at The Yarn and Fiber Company for your Fibering Convenience!